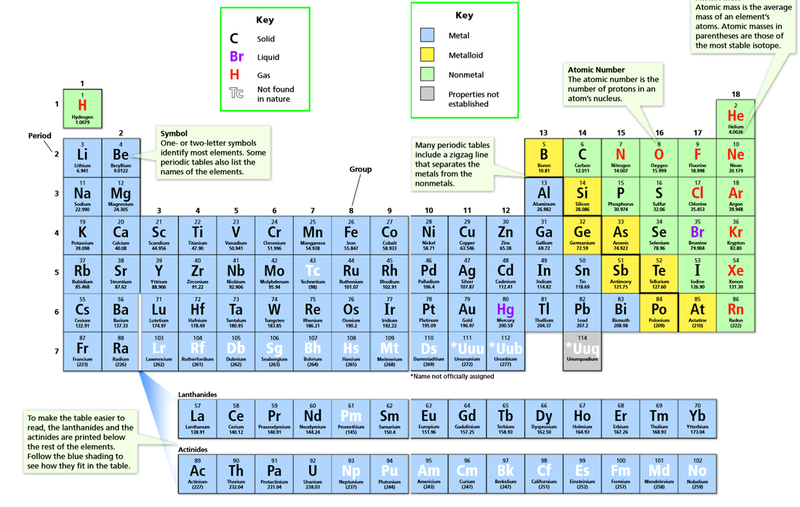 Chemists classify an element as a metal based on its properties. Look again at the periodic table. All of the elements in blue-tinted squares to the left of the zigzag line are metals. The physical properties of metals include shininess, malleability, ductility, and conductivity. A malleable (mal ee uh bul) material is one that can be hammered or rolled into flat sheets and other shapes. Conductivity is the ability of an object to transfer heat or electricity to another object. Most metals are good conductors. In addition, a few metals are magnetic. For example, iron (Fe), cobalt (Co), and nickel (Ni) are attracted to magnets. Most metals are also solids at room temperature. However, one metal—mercury (Hg)—is a liquid at room temperature. Chemical Properties: The ease and speed with which an element combines, or reacts, with other elements and compounds is called its reactivity. Iron, for example, reacts slowly with oxygen in the air, forming iron oxide, or rust. If iron is not protected by paint or plated with another metal, it will slowly turn to reddish-brown rust. The destruction of a metal through this process is called corrosion.